Alberta F. Brown to the Black Women in Pembroke College, 1 November 1968, Box 35, Folder 262, Students–Black Student Incident 1968 December, The University Archives, Brown University John Hay Library. “Elements of Tradition and Change: Brown University’s First 250 Years.” John Hay Library. Brown University. November 11, 2014. Brown University Office of Public Information, 1968, Box 35, Folder 262, Afro-American Society, The University Archives, Brown University John Hay Library. “Negroes at Brown U. Begin a Boycott of Classes.” The New York Times. 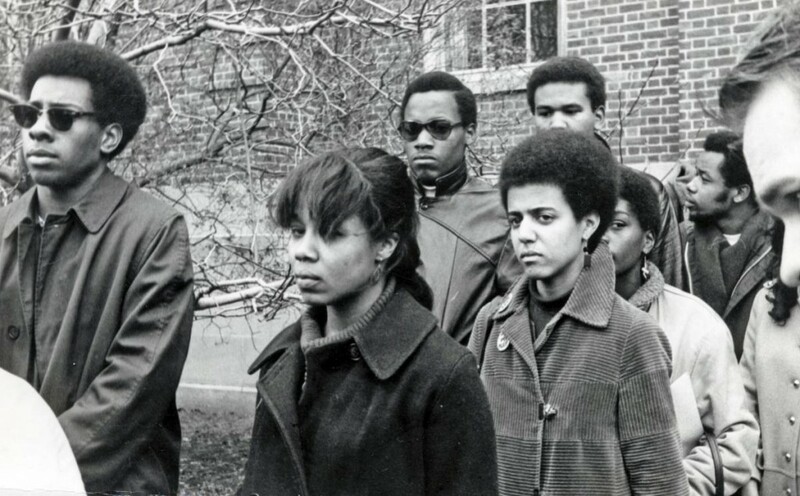 December 6, 1968, Box 35, Folder 262 Students—Black Student Incident 1968 December, The University Archives, Brown University John Hay Library. 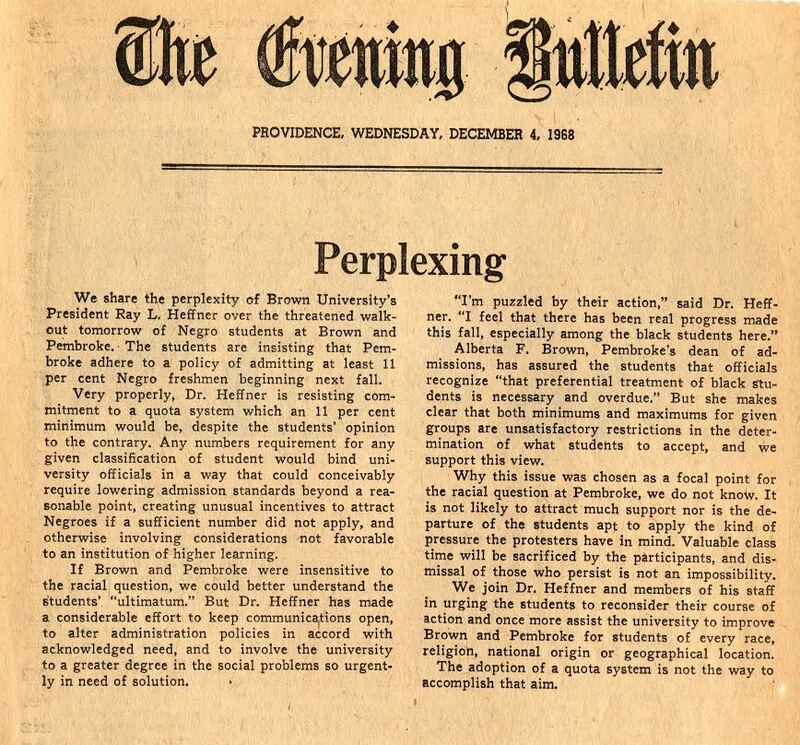 “Perplexing.” Evening Bulletin, December 4, 1968, Box 35, Folder 262 Students–Black Student Incident 1968 December, The University Archives, Brown University John Hay Library. The Black Men of the Afro-American Society at Brown University. Letter to the editor, Brown Daily Herald, December 5th, 1968. “1968 Walk Out,” Brown University-Pembroke College, June 8, 2008. https://www.youtube.com/watch?v=MZmEY4ZMpGI. Biondi, Martha. “Controversial Blackness: The Historical Development & Future Trajectory of African American Studies,” MIT Press Journals , no. 2 (2011): 226­237, doi: 10.1162/DAED_a_00090. Cowell, Susan Virginia. Interview by Miriam Dale Pichey. Offices of the International Ladies’ Garment Workers’ Union. Brown University, December 21, 1988. Warren, Peter. “Blacks Set To Leave University.” The Brown Daily Herald [Providence] December 5, 1968. The student-administration efforts had so far not produced the desired results of increased Black enrollment. In addition to the administration lacking in urgency, they misrepresented the demand of having 11% Black students in the incoming class as a racial quota system and undermined student power. This act of resistance became known as the 1968 Black walkout. This article justified the Brown administration’s resistance to the demands of its Black students. By highlighting the administration’s attempts to keep communication open, the writer attempted to subvert the reasons for the walkout, and draw negative attention away from the administration. The demands were further characterized as irrational when the writer appraised administration and questioned student demands. “Perplexing.” The Evening Bulletin. December 4, 1968, Ray Lorenzo Heffner files, Box 35, U.A. For Brown’s 250+ Celebration, several panels were displayed around campus. The John Hay Library exhibit presented a panel on the 1968 walkout that portrayed a succinct event in which a problem arose, and with minor adjustments, the administration was able to solve the issue quickly. It states that through organized student protests and administrative support, “Brown evolved…[to a] diverse student body.”  In this way, the panel minimized tensions inherent in the administration’s early reluctance to adhere to student demands. Contrary to this easy evolution, we must remember the Black student protest and the administration resistance to the 1968 walkout. It is crucial to understand the history of students of color at Brown, whose contributions in shaping University values of social change must not be forgotten. The Black Men of the Afro-American Society at Brown University, letter to the editor, Brown Daily Herald, December 5th, 1968. Alberta F. Brown to Black Women in Pembroke College, 1 November 1968, Ray Lorenzo Heffner files, Box 35, U.A. “Negroes at Brown U. Begin a Boycott of Classes.” The New York Times. 6 December 1968, Ray Lorenzo Heffner files, Box 35, U.A. “Elements of Tradition and Change: Brown University’s First 250 Years.” John Hay Library. Brown University. 11 November 2014.